When I took off the mountings, these two shims were on one side only, the other side not shimmed at all. I put the mounts and the shims in the parts cleaner to soak and this is where the problem has arisen. The crap on the shims when I took them out hid the fact that there weren't two separate shims, but numerous thin shims all stuck together on each side of this mount. The parts cleaner did its thing cleaned off the crap and I now have multiple thin shims and no idea of what went where. Would it be safe to assume shimmimg would be equally split between front and back? Are these the shimms that effect wheel camber angle? Is it odd that there were only shims on one side? Pretty certain this whole IRS has been stripped and rebuilt before with some odd findings in this strip down. 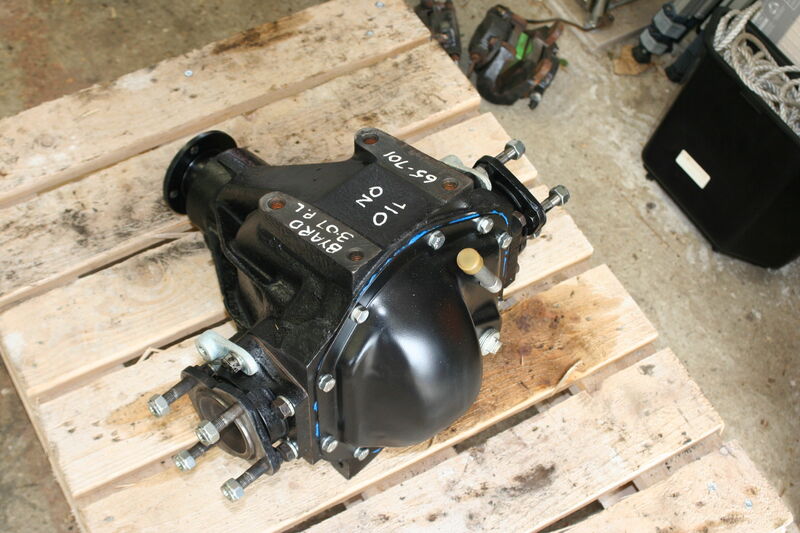 Pictures of the overhauled Diff back from Alan at AJS Engineering...included just because think it looks great as a lump of engineering in its own right. 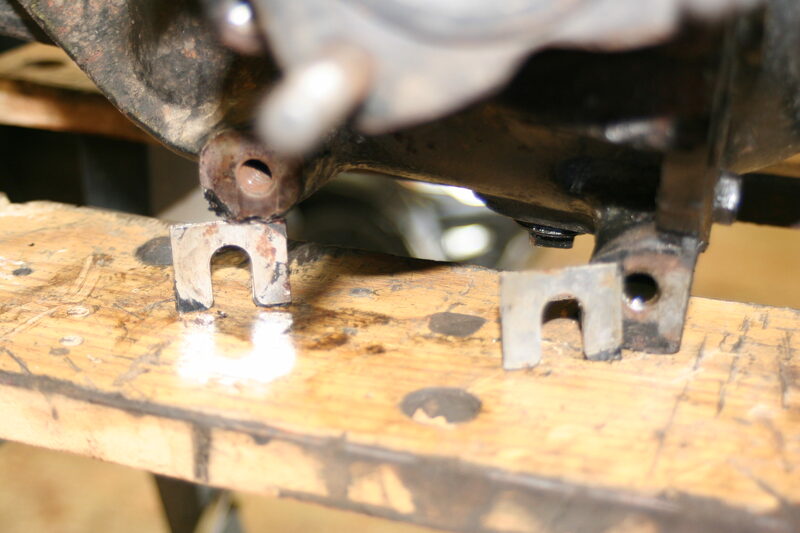 These shims are used to align the bores of the brackets with the holes in the Rear Suspension Cradle. Accordingly, you can't just divide the number that you have and put equal amount on each side. 2. Place the brackets in position and insert the Inner Fulcrum shaft through the holes in the Cradle and the bores of the brackets. 3. insert the two bracket bolts each side and do them up lightly until the taper of the bolt head makes light contact with their corresponding counter sinks in the bracket. This will roughly align parallel the mating faces of the brackets and the differential housing. 4. Using a set of Feeler Gauges, measure the gap between each of the mating surfaces of the differential housing and the brackets. 5. Place shims equaling the gap measurement gained in point 4 above. 6. Tighten all four bracket bolts and test if the Inner Fulcrum Shaft can be moved axially with only light force. Ideally, you should be able to push these rods axially by hand. 7. If still too tight (usual at first test after tightening bracket bolts), loosen bracket bolts and add thinnest (0.005" available off the shelf, or make thinner shim from shim stock) shim to each shim stack. Tighten bolts and retest force required to move Inner Fulcrum shaft axially. Thanks for the info much appreciated and something of a relief. Not as major a problem as I'd first thought. Still to get cage and mounts cleaned sand blasted and painted up. Will let you know how getting it all back together goes. 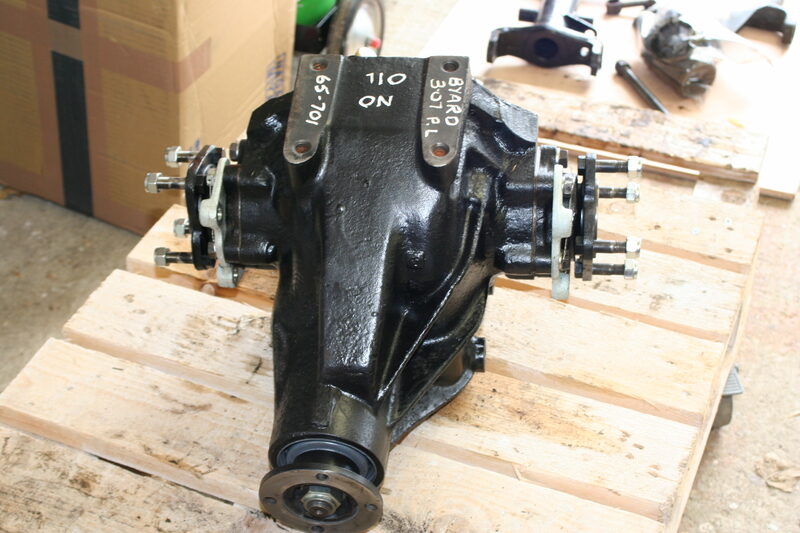 Just wondered if this differential is from your 1968 car as shown below your signature as this appears quite an early differential as it has separate bolt-on brake caliper mounting brackets ? Good spot. This diff did come out of my 68 car, but it is indeed a 1965 build diff. Alan at AJS did flag this when I picked it up. I think this whole strip down and component overhaul has flagged up a number of anomalies on my car, this being one of them. I've tried to go back and get as much history on the car as i can find but there is approx 6-7 years where it is completely off the radar, with no information available at all. I have a gearbox with a serial number that the data from Porters "Jaguar E Type Book" says shouldn't be on it! However the Heritage certificate identifies it as the correct gear box. The original engine went some time ago I believe. I have an early series 2 4.2 engine in it now. Its all making for an interesting restoration and I'm not overly concerned about the anomalies as my plan for the car is to give it another 50 years of life and keep it in the family. Originality is not an issue though I'd like to keep a close as possible to what the car should look run and sound like. Hopefully my children and grand children will be driving this one long after ive checked out.